What has caused a sudden and tragic jump in mass casualty attacks in Pakistan with over 200 deaths, mostly of Hazara Shias, in a single day on January 10, 2013? Is it just impunity or blow back from intensified US drone attacks early in 2013 as President Barack Obama accelerates US pull-out from Afghanistan? Or is it lack of national political consensus in Pakistan to punish the blood-thirsty Taliban and their murderous sectarian allies like LeJ and SSP? In other words, US drone strikes do kill mainly militants in FATA but also cause a blow back in the rest of the country for law enforcement and innocent civilians, and the Pakistani civil administration has failed miserably in dealing with it. 1. Hazaras are a soft target. They are easily identifiable by their facial features and known to live in certain neighborhoods in and around Quetta. 2. Police in Baluchistan have miserably failed in bringing to justice the sectarian attackers who are allied with the Taliban and operate with impunity. 3. When the police do arrest and prosecute terror suspects, the conviction rate in Pakistani courts is in single digits. It's either due to inadmissible evidence, poor investigative techniques, lack of witnesses or possibly judges who fear for their lives. Well-known terror suspects who openly confess to murderous attacks are allowed to walk free by judges for lack of eye-witnesses. 4. 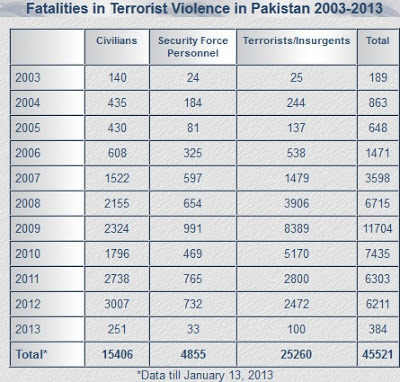 Pakistani parliament has failed to enact serious anti-terrorism legislation in the last 5 years to respond to rising civilian casualties in terrorist attacks. The goverment has also failed to protect witnesses, lawyers and judges involved in prosecuting terrorism suspects. 1. Enact the “Investigation for Fair trial bill-2012” as soon as possible. This bill makes electronic evidence such as video footage, telephone wire-taps and e-mails admissible in terrorism cases to reduce reliance on eyewitnesses. 2. Start a serious witness protection program and provide enhanced security to lawyers and judges in terrorism cases. 3. Train police, prosecutors and judges in modern criminal justice techniques and processes to increase their effectiveness. 3. Build broad national political consensus for decisive military action in FATA from where the Taliban terrorists and their sectarian allies get support and training to carry out devastating terrorist attacks against innocent civilians throughout Pakistan. Pakistan must now prepare to better protect its civilian population from the intense blow back as the US intensifies its drone campaign in FATA to ensure safe withdrawal of American troops from Afghanistan in 2013 and 2014. Ishaq was shockingly released from prison in 2011 after the courts said they didn’t have enough evidence to convict him. As is often the case, witnesses are not protected and are either eliminated or reduced to a terrified silence. The prosecution and the police fail to marshal the evidence necessary to support a conviction. There are also questions that analysts raise about Islamabad’s intelligence agencies’ links to sectarian groups like the LeJ and its parent organization, the SSP. Ishaq has barely been prevented from roaming around freely. He was briefly taken into custody once only to be released again. He and his cohorts are also the beneficiaries of sordid deals with Pakistan’s power elites. When the army’s headquarters were under siege in 2009, Ishaq was reportedly flown from prison to help negotiate a stand-down. The Punjab government, lead by the opposition Pakistan Muslim League-N, has courted votes alongside leaders of the anti-Shi‘ite SSP. The failure of Pakistani authorities to protect the Shi‘ite population and act against their killers is eroding faith in the state and its institutions. Their failures amount, as Human Rights Watch has said, to complicity. It also raises troubling questions about Pakistan’s identity. In 1947, after the partition of the subcontinent, Pakistan was founded ostensibly as a state for the region’s Muslims — and the minorities that live there. The founder, Muhammad Ali Jinnah, was himself a secular man of a Shi‘ite background. Do you know what happened to that Baboo Bujrangee in Gujarat? Where is that fellow now? Is he also roaming around freely like Ishaq Malik and talking about how he ordered people killed? HWJ: "Do you know what happened to that Baboo Bujrangee in Gujarat? Where is that fellow now? ...is he also roaming around freely like Ishaq Malik and talking about how he ordered people killed?" Well, he did roam free for a decade. And Modi, the mastermind of the Gujarat Muslim massacre in 2002 is still ruling Gujarat and in line to be the next PM of India. LAHORE - South Asia's most modern forensic laboratory is being built in Lahore, which will prove to be a milestone in eradicating crimes, bringing criminals to justice, investigating crimes on scientific lines and providing justice to people, Punjab Chief Minister Shahbaz Sharif said on Sunday. He was addressing a meeting during a visit to the under-construction Punjab Forensic Science Agency near the Thokhar Niaz Baig. The Punjab Police inspector general, Punjab home secretary, Punjab health secretary and other senior officials were also present on the occasion. Shahbaz directed officials to accelerate construction work of the forensic laboratory. Forensic Laboratory Project Director Nayyar Mehmood gave a detailed briefing to the CM. Shahbaz said that the project is of international standards and has vital importance, which would not only help curb crimes but also trace criminals involved in heinous crimes for bringing them to justice. He said that establishment of this unique and latest laboratory would not only benefit Punjab but other provinces as well. The CM said that protection of life and property of citizens and eradication of crimes is top priority of the Punjab government and establishment of the forensic lab is an important step in this direction. He said that every life is precious for the Punjab government and funds are being provided for this important project by curtailing other expenditure. The Forensic People of Turkey and Dow University of Medical and Health Sciences signed a memorandum of understanding at Governor House on Tuesday to build the first forensic lab in Karachi. Sindh Governor Dr Ishratul Ebad Khan said that the forensic lab was necessary considering the law and order situation in the city. The lab will be set up at the Ojha campus of Dow University. “DNA tests will help us ascertain the genealogy or personal ancestry of a person,” said Khan. The adoption of a formal guide to targeted killing marks a significant — and to some uncomfortable — milestone: the institutionalization of a practice that would have seemed anathema to many before the Sept. 11 , 2001, terrorist attacks. Among the subjects covered in the playbook are the process for adding names to kill lists, the legal principles that govern when U.S. citizens can be targeted overseas and the sequence of approvals required when the CIA or U.S. military conducts drone strikes outside war zones. U.S. officials said the effort to draft the playbook was nearly derailed late last year by disagreements among the State Department, the CIA and the Pentagon on the criteria for lethal strikes and other issues. Granting the CIA a temporary exemption for its Pakistan operations was described as a compromise that allowed officials to move forward with other parts of the playbook. The decision to allow the CIA strikes to continue was driven in part by concern that the window for weakening al-Qaeda and the Taliban in Pakistan is beginning to close, with plans to pull most U.S. troops out of neighboring Afghanistan over the next two years. CIA drones are flown out of bases in Afghanistan. The former official and other current and former officials interviewed for this article spoke on the condition of anonymity because they were talking about ongoing sensitive matters. Obama’s national security team agreed to the CIA compromise late last month during a meeting of the “principals committee,” comprising top national security officials, that was led by White House counterterrorism adviser John O. Brennan, who has since been nominated to serve as CIA director. Brennan spent 25 years at the agency before serving as chief counterterrorism adviser to Obama for the past four years. During his White House tenure, he led efforts to impose a more rigorous review of targeted killing operations. But he also presided over a major expansion in the number of strikes. Brennan’s confirmation hearing before the Senate Intelligence Committee is scheduled for Feb. 7. ^^RH Quotes Indian politicians: "BJP sought to know why he refrained from using the term "Islamic terrorism" even though he used the words Hindu terrorism during his reply to the debate on the internal security...."
Well? Don't you think it is a good question? Does the Indian Home Minister have an answer? What do you think is a good answer to the question? Please elaborate on your view. HWJ: "Does the Indian Home Minister have an answer?" ISLAMABAD: US Ambassador to Pakistan Richard Olson Sunday said the US would extend all the necessary assistance and equipment to help Pakistani law enforcement agencies to check incidents of suicide attacks and bomb blasts. He said the United States highly values its relations with Pakistan, adding that they acknowledge the sacrifices made by Pakistan during war on terrorism.The ambassador had meeting with Interior Minister Rehman Malik and exchanged views on bilateral relations and security situation, particularly in Federally Administered Tribal Areas (Fata). He appreciated the arrangements made by the Ministry of Interior during the long march for the security of the participants. Olson also lauded interior minister’s services for taking special measures to ensure safety of ambassadors and diplomats. The interior minister said Pakistan was doing its level best to improve law and order but it has its own limitations. He said due to resource constraint, the law enforcement agencies were handicapped. He welcomed the ambassador’s assurance for the equipment and hoped that this would help in nabbing the miscreants. The ambassador also pointed to the assistance for improvement of power situation and for the education sector in Pakistan. Sen. John Kerry, D-Mass., opposed cutting foreign aid to Pakistan by arguing, among other things, that the Pakistanis haven’t gotten enough credit for their assistance in the operations that led to the killing of Osama bin Laden. Kerry was responding to Sen. Rand Paul, R-Ky., who suggested that the United States demand that Pakistan release Dr. Shakeel Afridi, whom they arrested after he helped the United States find bin Laden. Kerry noted the logistical support Pakistan provides to the Aghanistan war before suggesting that Pakistan helped American forces get bin Laden. Afridi was arrested after working as a CIA informant to help find bin Laden, who was living in a compound in Abbottobad, Pakistan, before Navy Seals killed him. He told Fox News that he has been tortured for helping with the operation. “I tried to argue that America was Pakistan’s biggest supporter – billions and billions of dollars in aid, social and military assistance — but all they said was, ‘These are our worst enemies. You helped our enemies,’” Afridi said, describing the response he got from Pakistan’s Inter-Services Intelligence. The State Department has called for his release. “We believe that the prosecution and conviction of Dr. Afridi sends the wrong message about the importance of our shared interest in taking down one of the world’s most notorious terrorists,” a spokesperson told Fox. Pakistan reportedly granted China access to the stealth helicopter that crashed during the bin Laden raid. ^^RH: "Pakistan reportedly granted China access to the stealth helicopter that crashed during the bin Laden raid"
This is an excellent approach. It may just work if we keep at it. With its rugged hills, narrow valleys and green plains, South Waziristan has long been perfect terrain for the sort of guerrilla warfare favoured by the Taliban in its fight with the Pakistani army. Now it's the turn of the country's fledgling off-road car-racing community to have the run of the landscape. In an effort to persuade a sceptical public that it has got the better of the Taliban and that life in one of the country's seven troublesome tribal "agencies" is improving, Pakistan's army is inviting car enthusiasts to hold a motor rally on a 80-mile (130km) route in the region in the last week of March. The race will start just outside the agency and pass through various key locations, including the town of the Kotkai, a former Taliban-controlled town where militants once trained child suicide bombers until the army retook the area amid heavy fighting in the summer of 2009. Organisers hope about 50 cars and their back-up vehicles will take part in the race, which they want to become an annual fixture in Pakistan's motor sports calendar. "Peace has returned to this area and locals will feel confident once foreigners and people from other parts of the country come," said Major Farooq Virk, a military spokesman. "It is very secure and no incident has happened in this area for the last year and a half." So far just a handful of car enthusiasts have signed up. One of them is Asad Marwat, president of the Islamabad Jeep Club, who said some car owners may stay away because of the perceived security threats. "If it is something for the benefit of country, and it can bring some positive images around the world, we will take our chances," he said. "Hard-core rally buffs won't have any problem." Just three months ago authorities did their best to dissuade the politician and former cricketer Imran Khan from travelling along exactly the same route to Kotkai with a few thousand of his supporters by arguing it was too dangerous. The army now insists that South Waziristan is safe and ready to open up for business – or at least the small portion of it that has benefited from near-saturation coverage by Pakistani troops. Critics say peace has been achieved at the expense of the people of the area, particularly members of the Mehsud tribe, who were forced to leave South Waziristan when operations to clear the Taliban were launched in 2009. "Such gimmicks have been tried in the past with no impact," said Rustam Shah Mohmand, a retired political agent who served in the Federally Administered Tribal Areas (Fata). He recalls football and basketball matches being held in other areas where the army has dislodged militants. "With 80% of the Mehsuds having left the area, staging such shows cannot really achieve anything," he said. Car clubs have sprung up around Pakistan in the last 10 years with enthusiasts meeting for organised races that take advantage of the country's varied terrains, including deserts and snow-capped hills. The most prominent Pakistani petrol-head is Mir Nadir Magsi, an elected politician once described as the "Pakistan's Michael Schumacher" for his winning streak in various rallies. Asad Sethi, the founder of the Frontier 4x4 Car Club in Peshawar, has just returned from a weekend event in Malam Jabba, a hill town once overrun by the Taliban. But critics are unlikely to be convinced as long as the tribesman who used to live in the area stay away. ^^RH: "And Modi, the mastermind of the Gujarat Muslim massacre in 2002 is still ruling Gujarat and in line to be the next PM of India." OMG! What is going on here? I thought that he was a mass-murderer like Hitler. What are the Europeans doing? Senator Rand Paul dominated the news this week with his 13-hour filibuster about the potential for armed drone aircraft dropping their deadly payloads on Americans here in the United States. It was a hypothetical scenario designed to pressure the Obama administration into acknowledging that noncombatant US civilians – however much they might be suspected terrorists – would not be targeted while walking down the street or sitting in a café, that the president does not have the constitutional authority to do that. Not so hypothetical is the issue of hundreds of other noncombatant civilians – women, children, and old men, mainly in Pakistan – ending up as collateral damage in US drone attacks aimed at those believed to be terrorists connected with Al Qaeda. US officials acknowledge that there have been some incidents in which civilians were killed as the result of drone strikes, but the impression left is that there are few such civilian deaths. Under the circumstances, that’s difficult to prove. And as Natasha Lennard points out in Salon, “the very question of how the administration categorizes ‘civilian’ or ‘enemy combatant’ is in itself contentious.” It has been reported that the US government counts all adult males killed by strikes as “militants,” absent evidence which later shows them to have been innocent bystanders. But that low-number assertion by Sen. Feinstein, Mr. Brennan, and others has been challenged by independent reports indicating much larger numbers of civilian casualties due to “targeted killings” by drones. In an indication of the “positive trajectory” of the bilateral ties, the U.S. has issued a waiver, second in six months, for sale of major defence equipment to Pakistan citing national security interest. The waiver issued quietly by the then Deputy Secretary of States Thomas Nides on February 15, and posted on the State Department website a week later on February 22, would pave the way for some major defence equipment sales to Pakistan. “The Department issued the waiver because we have determined that security assistance is important to the national security interests of the United States and is a critical component of U.S. efforts to continue to build a strong, mutually beneficial relationship with Pakistan grounded in concrete action on areas of shared interest,” a State Department spokesperson told PTI. The waiver, issued within a fortnight of Secretary of State John Kerry taking the reins U.S. diplomacy on February 1, allows for the execution of America’s Foreign Military Financing (FMF) programme, and for the sale or export of certain Major Defence Equipment (MDE). “Major Defence Equipment,” means any U.S. manufactured defence article whose export is controlled by U.S. Munitions List which has a nonrecurring research and development cost of more than $50,000,000 or a total production cost of more than $200,000,000. These items require Congressional notification, the spokesman said. “As a matter of policy we do not discuss proposed defence sales or transfers until they have been formally notified to Congress,” he said, refraining to give any figure to the expected sale of major defence items to Pakistan after this waiver. According to a known South Asia expert, the two waivers issued by the then Secretary of State Hillary Clinton in September were sweeping and so allowed the release of all forms of assistance for the fiscal 2012 including non-military. It seems the main purpose of the February 15 waiver was to create a positive atmosphere for meetings in Washington DC with visiting senior military officials from Pakistan. “These waivers don’t represent an improvement in U.S.-Pakistan relations so much as they represent attempts to improve such relations,” an expert explained said adding that from the U.S. perspective, some level of working relations with Pakistan is necessary for the U.S. drawdown from Afghanistan to go smoothly. Observing that security assistance builds Pakistan’s capabilities in countering terrorism, the State Department official said that such assistance will continue to be implemented consistent with its policy goals of supporting Pakistan’s shared interest in regional stability and countering terrorism. “Despite the past challenges in our bilateral relationship with Pakistan, we are encouraged by recent engagements which indicate the positive trajectory of the relationship, including productive working group meetings addressing the full range of the relationship and Pakistan’s participation in Core Group meetings with Afghanistan,” the spokesperson said. The Bureau is publishing in full a leaked internal document – titled Details of Attacks by NATO Forces/Predators in FATA - which contains the Pakistan government’s own estimates of how many people have died in specific CIA drone strikes. NATIONAL surveys find that Pakistanis are overwhelmingly opposed to CIA drone strikes against suspected militants in the tribal badlands close to the Afghan border. The strikes are seen by many as an abuse of sovereignty, a symbol of American arrogance and the cause of civilian deaths. So when Sofia Khan, a school administrator from Islamabad, travelled with hundreds of anti-drone campaigners to a ramshackle town bordering the restive Federally Administered Tribal Areas (FATA) last October she was stunned by what some tribesmen there had to say. One man from South Waziristan heatedly told her that he and his family approved of the remote-controlled aircraft and wanted more of them patrolling the skies above his home. Access to the tribal regions is very difficult for foreign journalists; but several specialists and researchers on the region, who did not want to be identified, say there is at least a sizeable minority in FATA who share that view. American claims about the accuracy of its drone attacks are hard to verify. The best estimate is provided by monitoring organisations that track drone attacks through media reports, an inexact method in a region where militants block access to strike sites. However, the most thorough survey, by the Bureau of Investigative Journalism, suggests a fall in civilian casualties, with most news sources claiming no civilians killed this year despite 22 known strikes. Supporters of the drones in Pakistan’s media are even more reluctant to speak frankly. Many commentators admit to approving of drones in the absence of government moves to clear terrorist sanctuaries. But they dare not say so in print. In 2010 a group of politicians and NGOs published a “Peshawar Declaration” in support of drones. Life soon became difficult for the signatories. “If anyone speaks out they will be eliminated,” says Said Alam Mehsud, one of the organisers, who was forced to leave Pakistan for a time. There are some Pakistanis who argue that even a single civilian casualty in war is unacceptable under International Law. This is not correct. Civilian casualties in war are acceptable under International Law as long as civilians are not deliberately targeted and care is taken to minimize civilian casualties. Other talk of violation of Pakistani sovereignty. It's hard to justify claims of sovereignty over FATA unless Pakistan truly brings it into national fold by enforcing, or at least attempting to enforce, its constitution and laws. Even the Amnesty report which condemns US drone attacks in FATA is highly critical of Pakistani government's failure to act against terrorists to protect is citizens from them. The main problem with the US drone program in FATA is its secrecy. It is covert and operated by the CIA, an intelligence agency which is supposed to collect intelligence, not wage war. It does not operate under Geneva Conventions. 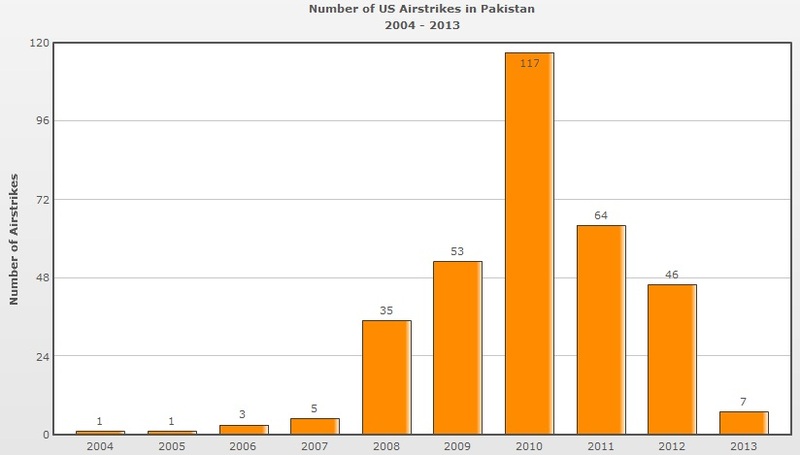 Identifying targets for the lethal American drone attacks in Pakistan was always dangerous. Then al Qaeda created its own strike force to target the informants. PESHAWAR, Pakistan—Half a dozen men sit on the floor in a grimy rented storefront in the crowded Khyber Bazaar. A bottle of locally brewed liquor chills in a water cooler in the corner, a Pepsi bottle next to it for mixing. A Bollywood soundtrack plays in the background. It’s a farewell party for Allah Noor, who has spent the last five years identifying targets in rural Pakistan for U.S. drone strikes. Ever since jihadis set up shop in North Waziristan in 2001, the region has become a battleground for a war between Pakistan, Afghanistan, the United States, and a potpourri of groups with sometimes overlapping agendas. Some groups, like the one led by Maulvi Nazir, once had a truce with Pakistan, agreeing to focus on toppling the Afghan government and reestablishing Taliban rule there. Others, like the Tehrike e Taliban Pakistan (TTP) vowed to topple the Pakistani state itself. Hundreds, perhaps thousands, of foreign fighters—Arabs, Central Asians, even Chinese Uighurs—flocked to North Waziristan, each bringing his own global struggle with him. In June, Pakistan launched an all-out military offensive in the region, ostensibly to evict all the militants from the area. The army claims to have killed more than a thousand. In the meantime, more than a million people fled the region. Even before the current military operation though, Pakistan had more than 140,000 troops stationed in FATA, the Federally Administered Tribal Areas, including many in North Waziristan. It felt the impact of most of almost three quarters of the 387 drone strikes that have hit the country. The very fact that so many troops co-existed with so many militants meant some kind of complicated alliances were afoot. Locals like Noor knew of those alliances firsthand. The city of Miran Shah, for example, was subjected to a nighttime curfew for years. Pakistani helicopter gunships regularly struck targets in the countryside nearby, as American drones circled overhead taking out high-value targets. One drone fired missiles, while three others tracked the target. None of this would have been possible if Pakistan did not clear the airspace in North Waziristan. Pakistani troops even fought off militants attempting to reach the wreckage of drones that had crashed.